For most of my life, I’ve been a student. I’ll always be a student, because we’re always learning, right? I know people say they can’t wait for formal school to be done, but when college was over for me, it felt like I was losing a part of my identity. I SO identified with being a student- it was (and still is) who I am. You can call it being the teacher’s pet, or whatever you want, but I’ve always sought to be in relationships with all of my teachers. I would linger in class after we’d finish so I could catch a juicy tidbit of info, or ask a question. I would think of ways to connect more deeply with the subject, go above and beyond with my projects and papers, study hard to pass my tests with no mistakes because I wanted to show that I was engaged, and that I cared about what the teacher was trying to teach me. Maybe it was how I was raised, or maybe it was just who I am (probably a bit of both), but my teachers have always been some of my favorite people. I’ve been very lucky to find that some have become more than just teachers- they’re my mentors, people who throughout my life I’ve looked to for guidance. Now, as I start to dive into becoming a teacher myself on a more regular basis, I find myself wishing I had taken better notes on how to be a good teacher. What is it about my teachers that drew me to them? What did they have to say that I found compelling? Sometimes, I doubt myself and wonder “Why would these students want to listen to what I have to say"?” Sometimes I simply wonder “What is it that I have to say?” It’s not that I don’t know things- I know I know things. But, being a teacher means somehow taking it to the next level and understanding how to make many different minds hear what you say, understand it in their own way, and process it and make it work for them. When you think about it this way, teaching is an immense responsibility and undertaking. No wonder I stress out about it every week! I’ve interacted with so many wonderful teachers in my life, that I know I have a tall mountain to climb to reach that level that my own teachers have reached. Beyond this, I can’t even imagine the time and effort it takes to go from teacher, to mentor. That is another mountain in itself. To make being a teacher into your life, connect personally with your students, let them into your own life, admit to your own failures or struggles in order to hopefully help your own students avoid them, and support them to the fullest extent. When I think about it, mentors are treasures to cherish. My ending thoughts are both of gratitude and of aspiration. I want to share how grateful I am for my mentors, and hope that I get the chance to return the favor and take on the role someday. It would be an honor to follow in the footsteps of the mentors I’ve learned from, and pass on their knowledge. I hope that by practicing good habits as a teacher, I can inspire my students just like my own teachers have inspired me. It’s a challenge but one that I seem to continue to rise to each week. Now, off to plan lessons! There is generosity in giving attention. I have trouble focusing on one thing, one goal, at a time. I think I’ve mentioned this before (no, really Molly? ), so it’s no surprise that I often have multiple balls in the air at the same time. I can be a very good multi-tasker and my day job demands that of me, as I often have to deal with more than one emergency or time-sensitive thing at the same time. I was speaking with my husband on the phone today and mentioned that I was writing an email as I was talking to him. I could almost hear him shaking his head at the thought of typing something while talking to him. Also, look at that picture. Who deserves attention- my blog post or my cute kitties? Sometimes, it’s hard to prioritize, so here I am covered in cats while trying to finish my blog post. Am I a freak of nature? No, I don’t think so. I’ve seen others do the same thing- talking on the phone while working on their computers. Working on a project while watching television. Even listening to music while working on something can be a form of multi-tasking. And sometimes, it doesn't mean I get two things done at once. It sometimes means it takes twice as long for me to finish something. In fact, I’d bet that’s true for most things I multi-task on. So, because, as Simone Weil says, attention is a form of generosity, I’m encouraging myself this month to be mindful of what I pay attention to. What am I giving myself to? Is it my phone, and social media? Am I giving people around me positive or negative attention? Am I paying attention to my work, or my students, or my teacher? What is my attention giving to the world around me? I hope that by bringing consciousness to my attention and where it is, I’ll begin to become aware of what I am giving my time and energy to, a precious resource. And, sometimes, it’s ok to multi-task. I don’t think it’s wrong to cuddle a cat while writing a blog- in fact, my kitties can be in inspiration to take it easy, and to remember to not take life seriously all the time and give my attention to things like cat cuddles and playtime. Sometimes, that is necessary too! 2018 was quite the year. Over the year, I have been reflecting each month on the lessons that I’ve learned and the things I am grateful for. Instead of keeping it to myself, this year I thought I’d share. Get a massage and chiropractic appointment each month. Some months are about making small steps, not big ones. Stuff isn’t important. Adults are responsible for themselves, and I am not responsible for them (most of the time). Three shows is too many shows (oops too late for 2019). I like alone time and plants. They make me happy. It is ok to take time off. Listen to people’s stories and ask good questions. Get out and have fun! Say yes and then figure it out (thanks Ellen Keane). Stretch before and after class and rehearsal. The time I have. My kitties. My dance companies. People who understand me. My parents. My home. My coworkers. My body workers. For evenings off. For being a year older. For my brain and my body. In looking forward to 2019, I know that I have one do and one don’t. First, travel is one of my top priorities. Trips already planned are to New Orleans, LA, to South Dakota for my brother’s wedding, and to Anchorage, AK, to meet my husband’s mother for the first time. I hope to plan other trips as well. As for the don’t, I don’t want to spend all day at a screen. This means making more time to be outside, to dance in a studio, to read a book, or to take a bath without my phone nearby. So, that means I’m going to wrap up this blog today so we can all get out and enjoy ourselves! But, don’t be afraid to share what you’re grateful for, what you’ve learned from your past year, and what you want to accomplish this 2019! Sometimes I like to look through my emails. They’re a trail of projects unfinished, ideas flung at walls and left to dry, thoughts that hang in the air encased in a thought bubble, but never placed out in the open. I like to think of myself as someone who is a doer, but when I read my emails from even the recent past, I realize that I like ideas, but I don’t necessarily always like executing them. I realize that this is because of my tendency to enjoy being the Jane of all trades, and master of none. I like a little bit of everything on my plate. I want to dance, but I also want to sing, I want to write, but I also want to sew. I want to have a home filled with art and plants and cozy things, but I also want to feel that I can also become a minimalist at the drop of a hat. I dip one toe here and the other toe there. This is how I’ve always been and I know this about myself. Being in a band with my husband (Although I wish we could continue this, we decided to focus on different things at this time. I miss it. I’m sure there is more. Just making me tired thinking about it. In light of my past habits, I don’t think that the right reaction is to make a promise to myself to reign it in or to finish everything that I start. One might think a New Year’s Resolution of focusing on following through might be just what the doctor ordered, but in my heart I know that would never work for me. I know people can change but this feels like something that is very “me”, an essential part of my bone structure and brain cells. Instead, I think that Austin Kleon, who wrote a lovely little book called “Steal Like An Artist” said it best - “Practice productive procrastination.” Have a bunch of side projects. When you get sick of one, go to the next. Why? It’s when you’re just messing around that good stuff happens. I think that my problem is that I sometimes take each side project too seriously. Maybe my ideas and explorations have led to other projects that I HAVE finished. I hope that they have contributed depth and insight into everything that I do. I think, in order to make peace with myself, I have to look at each unfinished project as a continuing part of my growth, as a part of the making of me. Forging multiple paths through the forest is way messier than forging one path, but damn it, I’m going to find way more interesting stuff along the way. Anyone else out there have this problem/tendency? How do you feel about it? Are you someone who picks something and finishes it to completion, or do you have lots of balls in the air at the same time? How do you juggle everything and when something drops, how do you feel about it? I’d love to hear from you! Out of body experience- was that me? My black tap shoes are finally seeing the light of day again! This month, I'm having a lot of those "was that really me?" moments. Was that me a year ago at my wedding? Was that really me who choreographed three new dances this year and presented them at various spaces? Was that me who opened two different shows in one month? Was that me who who stayed awake for all that? Like, seriously? As you can see by the date on this post, I took the month of August to recover.. and then September too. I turned 32 this month and apparently felt that taking a break from looking at my computer screen for any more time than I needed to was a present I needed to give to myself. That doesn’t mean I haven’t been busy. I spent the end of July with Juanna de Arco and the Majas learning a new work that she created. Although it came off of closing my show with Flying Foot Forum and I felt very much like I needed a long vacation, it was definitely worth the time. Wait, did I say I took the month of August to recover… ? Oh… lies. Immediately after that, I participated in the tenth year of Rhythmically Speaking at the Southern Theater. Rhythmically Speaking has been presented and organized by my friend Erinn Liebhard since I was in college, and having participated in the first one, seeing it ten years later was very fun and also very contemplative. None of my college classmates besides Erinn were in the show, and it made me think about where they have gone, and what we are all up to. I sometimes miss the community that college naturally creates, the nearly constant close vicinity you have to your friends, the connections you have with your professors, and the overwhelming opportunities for engagement and growth you are consistently presented. This September, I began teaching again for the first time in a while. In order to brush up on my teaching skills, I decided to dig out my college Dance Pedagogy portfolio (yes, I saved it, and yes, it was worth saving this past decade!) SO MANY GEMS. I found wonderful words of wisdom from my teachers, evaluations of classes I both witnessed and taught myself, great articles, and papers written by my classmates on a myriad of subjects. I just recently ran into my Dance Pedagogy teacher, Diane Aldis, for the first time since college. She remembered me, and it was such a joy to reconnect. She even gave me a jar of handcrafted Peach Bourbon glaze (which I just used on some grilled chicken tonight- thanks Diane! You are still the best!). These little moments of connection remind me that my college education was definitely worth it, that I was lucky to have so many awesome teachers, and the lessons are there for me to access anytime I feel doubt in my abilities. Thinking about myself in college is just yet another out of body experience at times, but reading my own notes does help ground me and remind me that I know what I am doing! I have friends who know what they are doing if I do not! I am not alone! Oh… did I mention my husband and I premiered my new choreography as a part of the Zenon Zone Summer Program in August after Rhythmically Speaking closed? Right… August was NOT a vacation. But, it was an awesome experience teaching the four women in my piece and working on composing music with my husband. I’d love to do this work again, and found it fed my spirit and my creative juices in a way that other projects have not done recently. I do enjoy the challenge of making new work- teaching new technique and movement to the dancers, costuming, composing music and poetry, working with my husband, and playing the cajon, all things I was able to incorporate in my piece. It was very me. Although, not too soon. September, well, September is birthday month! Happy birthday to me. So, I’ve done pretty much NOTHING— oh wait, that’s a lie. I took on teaching two tap classes at Ballare Teatro, as I mentioned earlier. It terrifies me and makes me happy at the same time. I can often feel like an utter failure with one breath, and then a total success in the next. My husband is very used to this roller coaster of emotions that teaching can bring, being in his fourth year of teaching middle school music with MPS but I’m still getting used to the ride. I’ve decided that this month, which also is almost to a close, is a month decided to self. I know that I can always give and there will be more to give, BUT, as my birthday card from my friends said, and I quote…. “hope you got a chance to relax and spoil yourself appropriately…” I tried to take this to heart this month. I got myself an addition to my tattoo (see my Instagram! ), got a haircut, bought new glasses, and even treated myself to a set of new (to me) wine glasses. I took a trip to ND to see my family for a day, and have been trying to let myself sit down sometimes. It’s hard, but I try. So, here’s to 32 years of life, remembering that yes, I did that, and I’m going to do more. This last couple of months, I have been reminding myself to breathe deeply as I've pushed myself to focus on the moments onstage with others, while also continuing to balance my life. Breathing deeply is a challenge for me- I like to to take tiny sips of a little bit of everything. But I've had many moments during the past couple of months that I'd like to savor more than I normally do. I'd like to remember what it felt like to improvise in the company of Kaleena Miller Dance onstage in a circle, or step onto the Southern Theater steps wearing a gold sequined sweater. I'd like to remember a smile breaking out on Peter O'Gorman's face as we found joy in our body percussion duet onstage in front of an audience, or the energy that the cast of Flying Foot Forum gave during our closing Can-Can number during French Twish. These are the moments we live for as artists, right? All too often they slip past us because we forget to take a moment to breathe deeply. Opening and closing two different productions within the span of two months while working full-time has also meant making time for the occasional nap (also really bad at those), always having a snack handy (I often forget to pack them), and making sure to do things in the present that future self would be thankful for (like spending that extra 20 minutes before going to bed to roll out my calf and arch muscles). It's also meant becoming a bit of a procrastinator as I begin working on my own choreography for the Zenon Zone Summer Choreography Program, making plans for rehearsal in the couple of hours before they begin and having faith that the dancers will trust where I'm heading in rehearsal, even if I'm not sure where the end is myself (thanks, dancers, if you are reading this). When I look back on June and July, I consistently see new iterations of myself, onstage, and offstage, and new versions of others I think I may know, but perhaps don't know all that well. These months have given me the gift of seeing new sides of people, acknowledging that I both know very little and perhaps more than I think I know, and also that I can do things I've never done before but also that I do have limits and need to respect them. That may seem like a lot- because it was a lot. It was insane and awesome, and I'm so grateful that I entered June and (almost) exited July with these reflections. 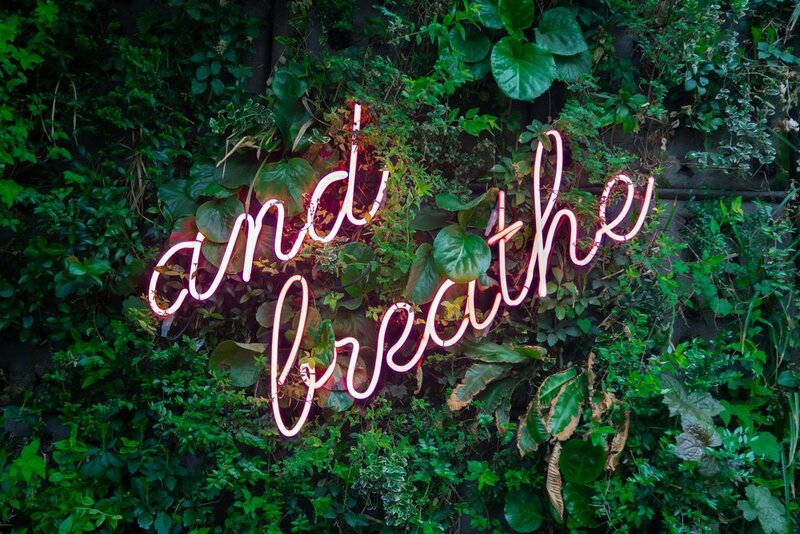 Remember to breathe deeply the next time that you find your life flashing by! What does it mean to be "in the trenches"? As I prepare to perform in two shows opening in June, and prep to show my own work in July and August. I've imagined myself in m own trench. I'm focused on what's in front of me. There isn't much to report, because the excitement of getting there has happened, and the battle hasn't begun. You're just there, doing the work, preparing for the day when it pays off. Stories of being in the trenches aren't that impressive. You're just.... there.... in the trenches. No one really wants to see photos of you in the trenches, because they'd be of you in rehearsal clothes in a dark room. I might sound like I don't like the trenches. But, that's not true. This is my fellow artist warriors build camaraderie and trust. We learn each other's languages, and habits, and guilty pleasures. We see each other on good days and not so good days. It's where you find your dance family and realize you see these people more often than your actual family. I'm OK with this. In fact, being in the trenches is what I do best. Performances are fun, but the trenches are LIFE. Lately, I've been very inspired by my fellow artists who make that commitment to step into the trenches every day, whether it's going to class, making rehearsal time for just yourself, or showing up to your regular rehearsals whatever gets the work done. Keep it up, artist warriors. You're amazing. Being in the trenches with you all is an honor. And to my non-artist friend, I haven't forgotten you. Don't forget to write! What better to do when your show is cancelled because of a historic snowstorm in mid-April than to write you all a letter! Our Saturday performances of Garden of Names was cancelled an hour ago due to this dangerous weather. I hope you all are safe and sound at home right now as I write this. However, I also hope that you were all able to experience the powerful performance I both was a part of and was able to witness from backstage. I believe the most powerful performance we had so far was our Friday school matinee. In front of an audience of teens, our director asked the audience "Remember when students protested guns just a little while ago? Well, what if those students just disappeared?" As I watched the character Cecilia say the names of teens arrested for protesting rising bus fares while holding a white dove and then making it "disappear", I imagined students at our local school disappearing, and imagined what the teens in the audience might be imagining happening to their friends, or to themselves. This was just a day after my husband and I had a conversation about teachers buying bullet-proof vests to protect themselves, and school districts buying teachers miniature bats to use as weapons in an attack on their classroom. Do we send our teachers to school in riot gear? Do we send our students out into the streets to protest? Do we arm our classrooms with guns, with safe rooms, with security guards? Apparently, we do. Does our government protect our most vulnerable, or does it protect its "right to freedom"? Apparently, our ideals are more valuable than our future. As I stepped off the stage into the audience on Friday night, an audience member paused to tell me that as we were dancing, bombs were falling in Syria, sent by our government in retaliation to recent chemical weapons attacks on Syrian civilians by the Syrian government. My reaction was was one of shock- and yet, how could I be surprised? History repeats itself. But, as artists we do believe that our reactions and actions matter. Tomorrow, Sunday Apr. 15th, we'll close "Garden of Names". For those who saw it, I hope that it inspired you to think about your actions, your reactions, and your ability to imagine a world where our future is valued. Or, I hope you come to our last performance on Sunday to be inspired. Musings on "Garden of Names"
I've been taking time this month to catch up with friends in the city this month. When not rehearsing, I've been making sauerkraut, holding babies, and visiting over a cup of coffee and a gluten-free doughnut. I hope that I've had the chance to see you in person, if you are reading this! But, if not, now is the time to come and see me in my first production of this Spring before I dive into a busy summer. I've been busy working with Zorongo Flamenco on "Garden of Names". Below is a link for tickets (and I encourage you to get them now!). It's been a really great experience for me to make connections again between Zorongo Flamenco and Flying Foot Forum, who are working together on this piece that they originally created in the 90's. Watching old videos of this performance, gleaning material from it, and seeing how the work is both transforming in the re-creation, and also how it is still relevant in our time, has been an invaluable learning experience. This piece is very theatrical, and tells a story, and you do not need to understand flamenco in order to understand the story or the emotions. I'm tired from shoveling, aren't you? Funny that I should title this "Committing" as I did not post a blog entry last month. But, it was a shorter month than usual, so I'm not too late, right? The month of February has been one where I feel as though I've been jumping over hurdles. My PC laptop crashed three times. My cat has asthma (yes, cats can get asthma). And, so much snow. Seriously so much snow. So, a few costly trips to the computer repair company, a really expensive cat X-ray, and a few days of shoveling later, I've recovered both my computer and my budget enough to write a post. And that's why I've decided to remind myself to make March about commitment. As rehearsals continue at Zorongo Flamenco Dance Theater for our April production, and thoughts of summer productions loom in the near distance, I remind myself not to let the goals I had set for myself in the beginning of the year slip away. The one goal highlighted in my day planner as top priority was creating a dance reel for myself, for future project applications. In the past, I've struggled to keep track of all of my production's videos, and so this year I searched through my files and begged my colleagues for copies. Gratefully, I've gathered enough materials and have finally started to put together this reel. I think that more than being able to use this reel for future purposes, my assigning myself this project was to get over my own fear of videos and editing. In the past, I've lost videos. Videos have failed to be recorded of my performances. I've edited videos for projects that don't get accepted. I forget to ask people to record me for performances. And if I do, somehow, they don't get recorded. Sometimes, I've felt like I have a bit of a curse when it comes to performance videos. But, this year, I'm breaking the curse and making it happen. I don't really believe in that curse, and I think that with practice I can begin to use my dance footage to my advantage. Even if my computer breaks down again and again, I'm backing up my footage and saving my files. I might not be tech-savvy, but I know who to go to for help, and I'll ask for it if I need it. It's a commitment to myself, to my work, and to my art. What have you committed to this year? Are you keeping any commitments, or need a reminder or an accountability buddy to keep them? How do you re-commit to yourself, even when there are hurdles to jump over? Early November, I suddenly found myself experiencing a sharp pain between my shoulder blade and spinal cord. You'd think it was a dance injury, but I honestly believe it was from me stupidly not holding a phone with my hands and instead squishing it between my shoulder and ear. Of course. I decided to try a massage therapist my teacher recommended to me. (Thanks Karla!). He thought it best to try his chiropractor. But before I could schedule an appointment, the wind literally knocked me off of my bike in December. The next day my ribcage felt bruised, but manageable. Seven days later, while reaching up to adjust my rearview mirror, I felt/heard a POP in my ribcage and suddenly found it difficult to take in a breath. Explaining why I couldn't make it to dance class that night was interesting- "Well, I was reaching for my rearview mirror, and now I can't breathe, sorry I can't make it to class!" You can't make this up. Seriously, HOW? 1. I love my chiropractor. I know some people don't believe in/trust them but I've been getting adjusted since I was small. I know what I feel like if I don't get adjusted, and I know what I feel like when I do get adjusted. I most definitely prefer the later. 2. A good massage therapist who really gets dancers is a precious gift. They can give you tools to take into your daily life that help you learn from pain and injury and become stronger and better. 3. A good chiropractor + a good massage therapist = a happy body. I am starting to see how my body workers tag-team issues throughout my body, and where one worker may fall short, the other can pick up the slack. Trying out different modalities has been helpful in finding ways to address different issues in my body, and to manage pain, discomfort, or immobility. So, have you thanked your bodyworker later? Or, do you need to find one to get started on your own recovery? I encourage you to talk to your friends to get recommendations. Word of mouth has always been the best way for me to find great people to work with me. I am grateful for the work they've done the past two months, and am happy to have them as a resource moving forward in my dance career. I hope you find a bodyworker who helps you to recover, or simply learn more about yourself! Yeah, my Instagram feed sometimes looks kind of glamorous. But, I also hope it also conveys my normal day to day slogging, too. This morning, I had one last gig to do to wrap up my participation in our Zorongo Flamenco Minnesota Tour. We visited six cities outside of the Twin Cities, and held our end of tour show in St. Paul. It was a great experience! Above you can see the hundreds of little kids who enjoyed our puppet show at Gustavus College last Thursday morning. They were super adorable, and it was lovely seeing all of their engaged little faces looking up at me and Olie, my puppet. One kindergarten class even sang us a cute goodbye song in Spanish (sadly, their Spanish is probably better than mine). My buddy Amanda took this photo, which I have titled "Post-Tour: A shovel, ice scraper, blanket, and lots of bags". I'm still in my flamenco dress. wearing my running shoes, and carrying every pair of flamenco shoes I own now in my dance bag (which are getting to become quite a collection) along with all the other things I brought in our Zorongo van. I love performing. It's pretty much what I do best. But, at this moment I was also looking forward to a bath and a nap, to unpacking my costumes and cleaning my house, too. I'm wearing my tennis shoes because my feet were legit tired of heels. And I'm not a tennis shoe kind of person, if you know me at all. My point is that sometimes we forget to post the not-so glamorous moments, and I'm glad Amanda was there to snap a photo of me living the real life. It's been almost a month since the tour ended. I've procrastinated even posting this blog. I've still been hard at work rehearsing, but some days, I find the need to stay home and take it slower. It's winter, it's gotten colder, and the holidays are fast upon us. Thanksgiving has already come and gone. And I've found it hard to jump onto the fast-running horse that is the process of getting ready for a show. I think that what I'm getting at in this post is that being an artist takes a lot of hard work, energy, and momentum, and I'm totally amazed and inspired by the artists around me who have made this their practice. Much of the time, the work behind the scenes is not glamorous and is not fun. It can be downright stressful. And each opportunity I have to take part in that process has taught me something, made me grow as a human, and inspired me to push forward. To all of you artists out there, you all have super powers in my eyes. I support you, love you, and encourage you to keep getting on that horse. If you ever want to talk about how it's not glamorous, and how it stresses you out, I'm here with a listening ear and open arms. I see you. Keep inspiring me. Don't stop! "It made me feel excited, well... excited and scared..."
You know, that moment in "Into the Woods" when Little Red Riding Hood is about to be eaten by the Big Bad Wolf, and it could turn terribly, but it's also exciting, and Little Red Riding Hood isn't really sure how to feel? That's what a public feedback session feels like to me! I showed my pickle piece (my nickname for it) at the 9X22 Dance/Lab at the Bryant Lake Bowl on Oct. 25th. For this showing, instead of making watermelon pickle like I did in September for the first showing, my best friend and I made apple pickle to share with the audience. Delish! Part of this showing includes a public feedback session immediately after you perform the piece. Every time I've done , I feel more scared and excited for the feedback as I become more and more invested in the work I do. Besides hoping that everyone liked my pickles, I was very interested to hear about what the audience saw, felt, and experienced, and was anxious about how feedback would impact how I feel about my piece going forward. This opportunity came at a good time, as my group will also get to show it AGAIN in January of 2018, at a brand new venue in Longfellow. 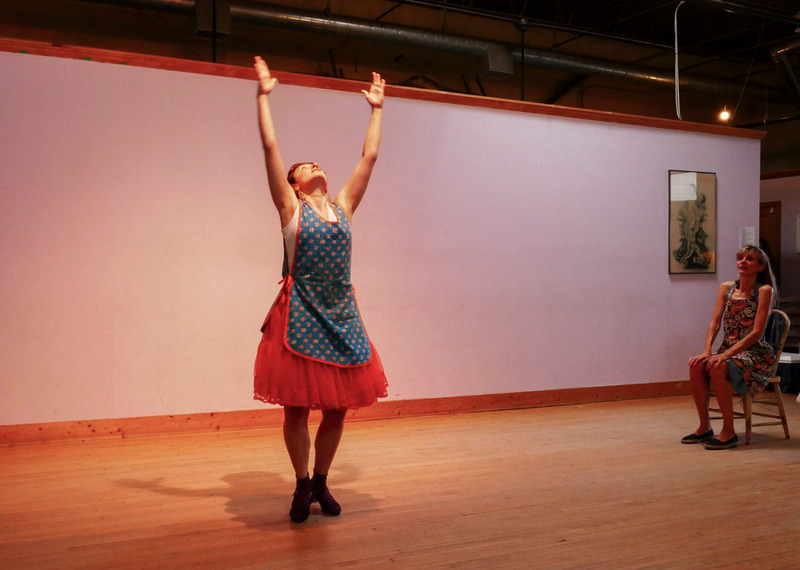 The showing was my chance to have a diverse audience, some Flamenco lovers who were familiar with the language of the piece, and other dance community members who could offer insights from a non-Flamenco perspective. My dance partner and I discussed what we thought the audience would be curious about before the show. I really wanted to know- what should I change? What was working? What memories were brought up by viewing the piece? Was it strange that my duet partner was seated the majority of the time? Was the audience curious about form, technique, or did the movement all simply make sense because it was me? Could they hear the recording enough to get what it was about? Did they want to hear more of the soundscape, or did they just want to hear the poem? Did they like the footwork along with the soundscape? Were they confused? Inspired? Curious? Honestly, I was most nervous and anxious about the feedback session, not the dance itself, because I hate speaking spontaneously in front of people. I'm not good at it and I make things up. Riffing can be a useful skill, but sometimes it's good to be prepared with something to say. Turns out, everyone had very different opinions about my dance. Many people did offer insightful thoughts andFunny how that works, right? One person thought the seated dancer was disabled, while another person thought her movement was very beautiful and was inspired by it. Some wanted to hear in the recording more clearly how to make the pickles, because that intrigued them. Others were curious how I fit the puzzle pieces of the recording and the movement together. Some saw my partner as an older sister, grandmother, and even an older version of myself, as in my own reflection. I should have been taking notes onstage. There was a lot to think about! Now, having had time to ingest the feedback, I have found that I need to always take all of it with a grain of salt, and remember that ultimately, I'm telling my story, not someone else's! Audience members will take what they see and put it through their own lens. I think that if I took the feedback from all of these perspectives, I would instantly lose sight of what I'm trying to say. But, if a piece of feedback comes up again and again, and is contradictory to what I'm trying to say, it's probably something that I need to consider. This also reminds me that as someone who enjoys critiquing other people's work, to put my own perspectives into perspective when critiquing is very important. It's a good idea to ask the right questions, and consider the lens of my own critique. This latest showing has inspired me to go SEE MORE DANCE and think critically about it, something that has fallen to the wayside since my graduation from college. I can't wait to see a show this weekend, and then write about it! After you show... revise, re-vamp, repeat! "Don't think about making art..."
But here's to starting fresh! A new year, a new day. If one doesn't start, then you just won't get started, as I've been heard telling my clients and students.